Leeds, the most populous city in West Yorkshire, offers plenty to do during a weekend break. It’s a hub for the arts, sports and shopping. The restoration of waterfront former industrial buildings has helped give the city centre an upbeat vibe. Here are a handful of points of interest and, come nightfall, Leeds has plenty of buzzing pubs and cocktail bars to pick from. The Royal Armouries Museum, by Leeds Dock, displays a part of the United Kingdom’s expansive national collection of arms and armour. Looking up in the stairwell of the Glass Tower reveals creatively arranged breastplates and weaponry. Over five floors you can see weapons from around the around the planet, including suits of medieval armour, items for hunting and Samurai equipment from Japan. Short films plus interactive, touch screen exhibits help explain the use of weapons and tactics during key battles. Throughout the day actors play characters and tell stories based on the experiences of soldiers. There are also opportunities to shoot crossbows on the range on the upper floor of the museum. Passionate about sculpture? Make sure you schedule a visit to The Henry Moore Institute, named after the Yorkshire-born sculptor known for his semi-abstract bronze artworks. 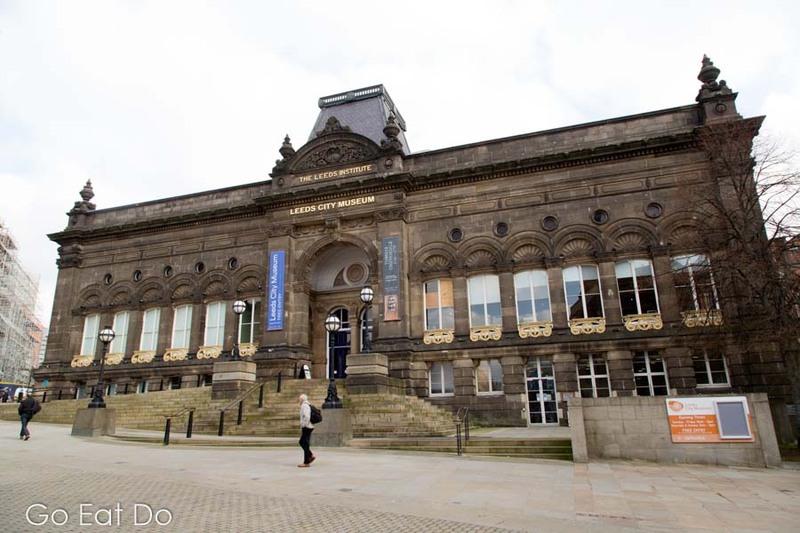 The free-to-visit gallery is at The Headrow, in the city centre, and open seven days a week. You can learn about the institute and works on display during free guided tours, which start at 2pm each Sunday (bookings are not required). To see more sculptures, you could also head to the Yorkshire Sculpture Park or The Hepworth Wakefield, the other nodes of what is known as the Yorkshire Sculpture Triangle. A Henry Moore sculpture outside of Leeds Art Gallery. Leeds Art Gallery stands next to The Henry Moore Institute. Moore’s Reclining Woman: Elbow stands by the gallery’s entrance. Even if you’re not an art fan, it’s worth browsing the information available at VisitLeeds, on the ground floor, to learn more about things to do and see in West Yorkshire. The Victorian building hosts sculptures and paintings of the Leeds Collection, including Scotland for Ever, by Lady Elizabeth Butler, depicting a charging cavalry unit in red tunics. The gallery’s ornate Tiled Hall Café is an attractive spot to sit and savour snacks and refreshments. Leeds Art Gallery and Library is on the Headrow. Elland Road is the 37,890-capacity home stadium of Leeds United Football Club. The club celebrates the centenary of its foundation in 2019. In 1992 Leeds became the last club to clinch the English title before the introduction of the Premier League. A statue depicting Billy Bremner, the Scotland international who captained Leeds during the club’s glory days of the late 1960s and early 1970s, stands with arms raised high outside of the ground, which is about three kilometres from the city centre. Want to see behind the scenes? Book a guided tour of the stadium, including the dressing rooms and head out of the tunnel leading onto the pitch and the pitch-side dugouts. Not a fan of football? Or simply not a fan of Leeds United? Go shopping at the Kirkgate Market. This family-friendly Thackray Medical Museum was established more than 20 years ago. It stands within the grand building that opened in 1861 as Leeds Union Workhouse, a place to house the needy. Themed displays, over two floors, convey how medical treatments have evolved since the Victorian era, when common illnesses and treatments differed markedly from today. The museum’s collection totals more than 47,000 artefacts relating to medicines and medical equipment. Visiting means an opportunity to see brutal-looking surgical tools and gain insights into the discoveries of vaccines and antibiotics. There’s an array of interactive exhibitions too. Youngsters have the chance to test their reflexes and ability to jump in the LifeZone gallery. On the first Saturday of each month guest speakers talk about aspects of healthcare through the ages. Leeds City Museum on Millennium Square is the city’s former mechanics’ institute. The Art Deco building, dating from the 1930s, was formerly the corporate headquarters of the Tetley Brewery. The Tetley is now a centre for the contemporary arts and has a café on its ground floor. It hosts regular exhibitions. It’s possible to step inside the wood-panelled room with the long table and leather-backed chairs at which Tetley’s directors sat during board meetings. Many of the other rooms have been converted in to artists’ studios. Not into contemporary art? An equine statue of the Black Prince stands outside the Old Post Office on City Square. Roundhay Park sprawls over nearly 300 hectares, including two lakes, in the northeast suburbs of Leeds. The landscaped parkland once formed part of a country estate that was repurposed as a public park as long ago as 1872. The refurbished mansion at its heart is now an events venue with a restaurant. The park has served as a venue for music festivals and concerts (two Ed Sheeran gigs are scheduled for mid-August 2019) and is a popular place for walking, running and sporting activities. Angling is permitted in Waterloo Lake, which is also used by canoers. A section of the park hosts Tropical World, a popular attraction landscaped to provide habitat for creatures normally seen in warmer climes. Alternatively, take a look at the Central Station Wagon Hoist, a steam powered hoist operated from the 1850s to 1950s, to lift railway wagons. Waterways once provided the most convenient means of transporting goods, so following the Leeds Waterfront Heritage Trail is a way of learning about industrialisation and urban growth in this part of Yorkshire. The four-kilometre trail runs along the River Aire between Granary Wharf, behind the railway station in the city centre, to Thwaites Mills Watermill, which is still operational. It passes the Victoria Bridge, Leeds Dock and The Calls (now the location of several stylish restaurants, including the Shears Yard and Aire Bar) along the way. Information boards with maps and diagrams hold details about the history of bridges and buildings, including warehouses from the time of the Industrial Revolution that, when renovated, are proving to be desirable business premises. How about something for a rainy day? This is the interior of the Corn Exchange, built so that Victorian merchants could trade corn. It now houses boutique stores. If shopping in boutique stores and upscale department stores sounds a dreamy way of spending a day, make a beeline for Leeds’ restored Victoria Quarter, which was designed by the architect Frank Matcham. The naturally lit County and Cross shopping arcades feature patterned wrought iron and mosaic flooring. Designer stores such as Coach, Ted Baker, Vivienne Westwood operate within the Victoria Quarter. The building that was formerly the Empire Theatre is now the Leeds base for Harvey Nichols. The Victoria Gate, a contemporary interpretation of Matcham’s Victorian-era designs, is home the largest John Lewis store outside of London. Not a shopper? It’s worth strolling by for the architecture. The ceiling of Queen Victoria Street also happens to be the biggest stained glass window in the country. Glass Cupola in the County Arcade shopping gallery in Leeds’ Victoria Quarter. Enjoy hunting for bargains? Then plan time to browse among more than 120 stores in the Trinity Leeds, an airy, multi-level shopping mall in the heart of the city. Its name is derived from the adjacent Holy Trinity Church, a Georgian place of worship. The mall has a choice of over 40 places to eat and drink, including the Trinity Kitchen which serves a selection of cuisines from around the world, including tortillas, American style ribs and a fusion of British and Indian street food. Guest food trucks operate for eight weeks at a stretch, meaning regular changes to the culinary offerings. Looking for entertainment? The multi-screen Everyman theatre shows mainstream movies, independent movies and live broadcasts. Leeds Trinity Shopping is named after the neighbouring Holy Trinity Church. Look up in Leeds and you’ll spot owls. Owls, which symbolise wisdom in this part of the world, appear on the city crest and on buildings across the urban core. The city’s current coat of arms was settled upon in 1836 and features three owls. The Leeds Owl Trail has details of the locations of owls and introduces their stories. They appear on locations including the railings by municipal offices, on the city library and, golden, on Millennium Square. Trail maps are sold at the VisitLeeds shop and are an innovative way of viewing the details of urban facades. What no owls? The Victoria Gate shopping centre is part of the city’s Victoria Quarter. To find out more about things to see and do in and around the city, take a look at the VisitLeeds and the city’s museums and galleries website. The Welcome to Yorkshire website is a source of ideas about nearby things to do. You may also find it handy to look at the Visit England website. Illustrating photographs are by Why Eye Photography. If you liked this post why not sign up for the free Go Eat Do newsletter? It’s a hassle-free way of getting links to posts. Of course, if you’d like to sponsor a post on Go Eat Do, please get in touch. Use Pinterest? Pin this for later. A weekend break in Leeds can include a visit to the County Arcade shopping gallery in the Victoria Quarter. So many beautiful buildings. I have only ever passed through Leeds – never spent any significant time there. It’s a city that really does reward staying a couple of days. Leeds’ nightlife means it’s worth experiencing over a weekend.